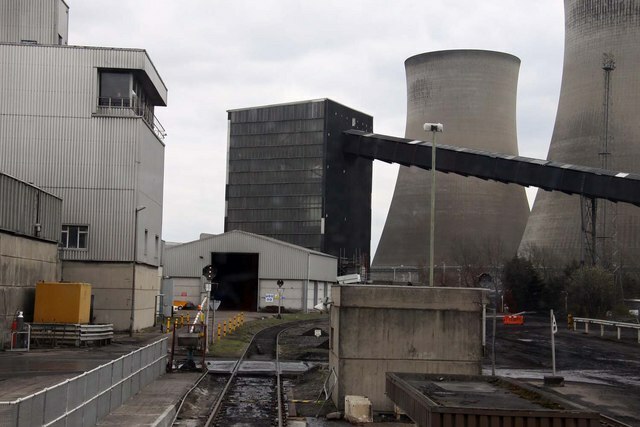 After 43 years, the Didcot A power station in Oxfordshire, England, has closed. It is a notable feature in the landscape, with 6 cooling towers and a 200m high chimney. Didcot A held the dubious accolade of being amongst the worst polluting plants in Britain. It has closed down under a European Directive which required either the removal of sulphur from flue gases, or closure, with a stay of grace from 2008 until now. I was surprised when I moved to the country from London 24 years ago to be beset by horrific Thames Valley lung diseases, including double pneumonia. I remain amazed that Wallingford, just 6 miles from Didcot, has been quietly absorbing detritus from the shadow of this major polluter for so long. Didcot A burnt coal and was later adapted to use gas as well. It could produce 2000 megawatts (MW) of electricity at any one moment, enough to supply 2 million households. Didcot B, burning gas since 1997 and with slightly over half the capacity of Didcot A, continues on but leaves a gap of nearly 1000 MW in our power supply. What fills the gap? How do we supply power-hungry Oxfordshire with enough electricity and heating fuel, without burning fossil fuels that are detrimental to our health and climate? What is our long-term strategy in this country? A friend recently returned from a visit to Sweden with glowing reports of their long-term 20-year energy plan. Currently 45% of their energy comes from renewables, chiefly hydropower and biofuels, and they aim by 2020 to increase this to 50%. Along the same lines, Germany is one of the largest consumers of energy in the world, and before 2000 relied heavily on nuclear power. However, the tsunami and subsequent radiation leaks at Fukushima have prompted them to move away from nuclear power as an energy source but they have yet to identify what they will focus on instead. Meanwhile, German citizens have displayed steady support for solar electricity. Last year, the total solar energy installed capacity in Germany was 33,000 MW, equivalent to sixteen and a half Didcot A power stations when there is full sun. And take the 20-20-20 notion in Europe: the EU has legally bound itself to achieve by 2020, compared with 1990, a reduction of 20% of both greenhouse gas emissions and energy consumption overall for the EU, whilst the share of renewables in the energy mix is to be increased to 20%. Weirdly, in Britain, a perfect location for wind power, we appear to oppose renewables rather than embrace them. We have been ambitious in reducing greenhouse gas emissions by 34% yet we drag our heels on renewables; aiming to increase its share in the energy mix to only 15%. Our target would put us 7th from bottom of 27 European countries, just above Malta, Cyprus, Luxembourg, Czech Republic, Slovakia and Belgium. In 2011, Sustainable Wallingford and Oxford’s Low Carbon Hub investigated the feasibility of wind turbine sites in Oxfordshire under a government grant. We discovered a high wind area that could produce significant energy right by the old Didcot A Power Station. But the very mention of wind turbines in today’s political environment raises hackles and produces a furious, divisive response. But wind isn’t the only option. The Low Carbon Hub project suggests that the power from Didcot A be replaced by the development of dispersed solar PV across Oxfordshire. The project would require extensive infrastructure development but would provide a long-term, sustainable solution to Oxfordshire’s power needs. Local hydropower is also an option that appears to be popular. When a new hydropower co-op offered shares in April 2013, it met its fundraising target in only three weeks. While this project still requires permitting that has proved challenging, the stage has been set for renewables to replace Didcot A. This replacement by renewables offers a quiet, clean energy-source to replace those dark chimneys, providing clean, cheap electricity to Oxfordshire. It is a major step towards setting Britain on a renewable energy path and reducing our carbon footprint. While the government has lagged behind the rest of Europe in setting ambitious carbon reduction targets, these types of actions on a local level offer a reassuring path forward for the rest of the country to follow. Image Credit: Steve Daniels via Wikimedia Commons. For a artistic representation of the place of the Didcot A in the community see here.